Incredibly enough, 2 months have passed and I all but fallen off the side of the Earth. I haven't, I hope to be able sometimes in April to come back and give you a somewhat detailed account of my crazy life. In the meantime: we are all healthy and kicking, just way busier than normal (and it doesn't look like we'll stop anytime soon, so I am trying to adjust). With this preamble, please accept my apologies for being late to my own party (shame on me!) and please allow me to welcome you to the party the CC7A is hosting: The Circle of Love. If you recall, I tried to send every one of the CC7 artists a gemstone doughnut. Most have not received (we figured out it is custom related, lesson learned), but they graciously went and either found a doughnut in their stash (we are all hoarders, don't you know it?!) or bought a similar one. The infinite links were done some time ago, for another necklace, which I never finished. They matched this new design so well, I could't resist using them! The 'leaf' is from a set my mom sent me - I still have a few components to re-use from it. As you know by now, I need fabric or pure metals on the skin, so while the necklace has a hook (I will replace it, it is ugly), I decided to make it length extendable. This cute little link does just that: allows the chord to be lengthen or shorten as you wish. Thank you for stopping by, and please make sure you visit the rest of the lovely ladies of the group: Christine, Cynthia, Emma, Monique (she'll post a tad later), Sally, and Therese. this is stunning Alicia! 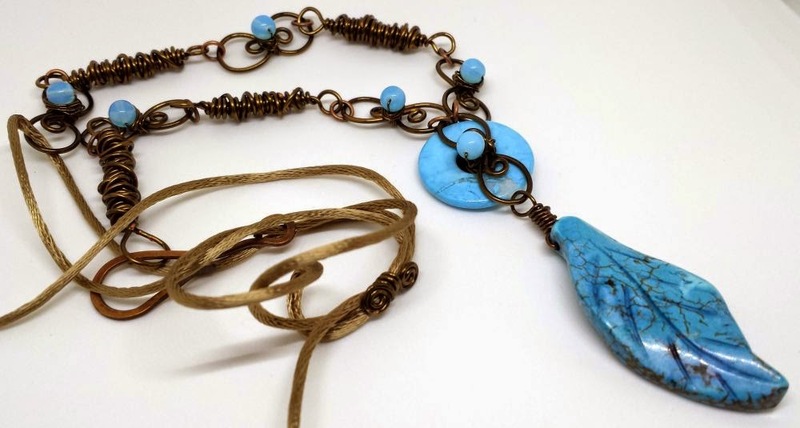 I love the gorgeous turquoise with the deep color of the metal ... and those hurricane wraps are awesome! what a beautiful design! Thanks for getting us all together for year two of CC7A! Your neclace is beautiful. 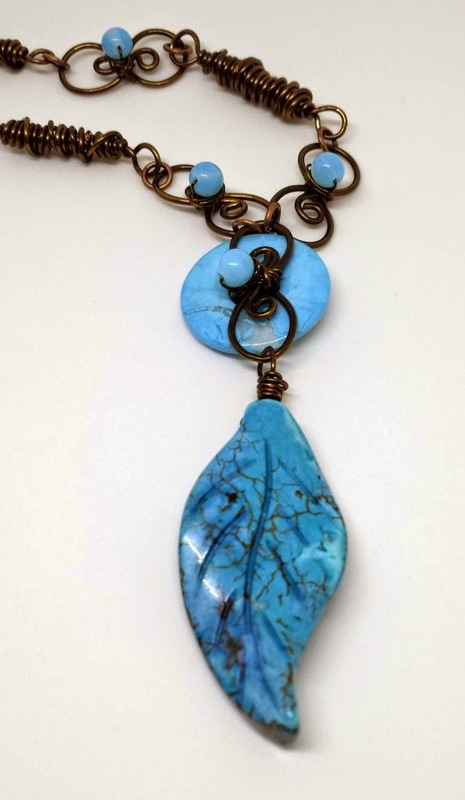 The dark bronze wire goes well with the Turquoise doughnut and leaf. I love the links with the beads attached to the center and the hurricane beads fit well with your design. Your piece was worth the wait. Thank you for bringing us all together again I am looking forward to the next seven months of challenges. Hi Alicia, Your necklace is beautiful. The extendable part makes it extra special. I really like your color choices. Alicia ~ this is beautiful and a bit flighty, in a really good way! The leaf floating to the ground, the sky blue colors, those infinity swirls, the hurricane beads ~ all motion and flight and movement. This must look fantastic on you! Thanks for putting together the Circle of Love event! I love the combination of elegant and chaotic in the wire work.